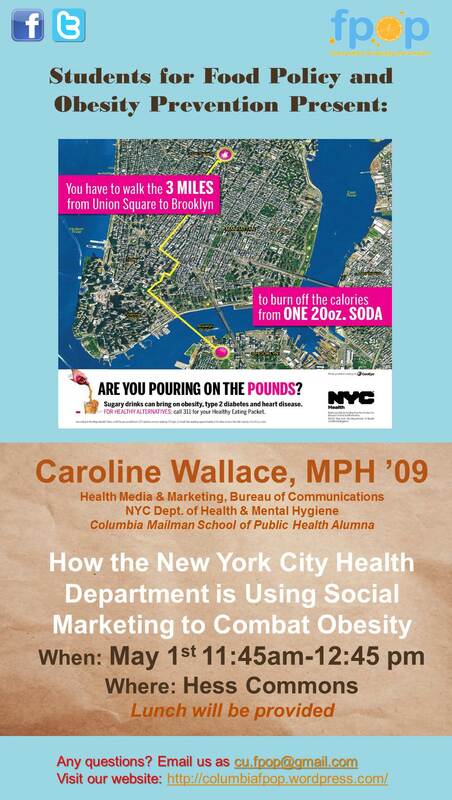 FPOP Event May 1st: Come See Caroline Wallace from the NYCDOH Talk About Obesity Related Public Health Marketing! FPOP welcomes Caroline Wallace, MPH for her talk on “How the NYC Health Department is Using Social Marketing to Combat Obesity.” Caroline, a graduate of the Mailman School of Public Health (09) works in the department of Health Media and Marketing in the Bureau of Communications at the NYC DOH.Most of us will recognize the “Pouring on the Pounds” campaign from the subways. Come learn more at this exciting seminar! This entry was posted in Guest Lecturers and tagged guest speaker, marketing, NYCDOHMH, obesity, pouring on the pounds, public health. Bookmark the permalink. Visit our Get Involved page to learn how you can contribute to FPOP!